(0 Customer Reviews) | Write Review 12 issues per year Men’s Running delivers editorial content which is 100% relevant to men who run – beginner or regular runner. Whether it’s ditching your gut, clearing your head or getting in shape for a race Men’s Running is the running magazine which understands the modern running man. In the age of falling gym memberships and burgeoning waistlines, Men’s Running delivers the perfect antidote to guys who need answers to their health and lifestyle challenges. 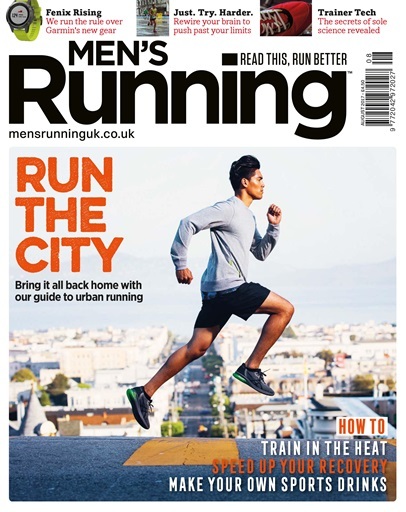 In a tone of voice you will enjoy with eye-catching design and a carefully considered mix of inspiring tales, high quality training and nutrition advice, Men’s Running stands out amongst other running magazines. Men’s Running will inspire and help you if you are looking to sharpen up for a race, burn fat or simply working towards a healthier lifestyle which encompasses eating right, clearing the head and bringing balance to the demands of a busy professional and family life which make staying in shape more important than ever. While the calendar may be full of organised races and events, not everyone’s running life is dictated by competition. Goals come in many different shapes and sizes and so does the impetus to achieve them. If this issue has a theme it’s that reasons to run go way beyond simply wanting to be involved in a sport. Take for example the five blokes who used their unwanted weight-gain as a spur to getting out and reclaiming their lives (p55). Not only did they turn their health around they also found out things about themselves they never would have without running. You can also find #runspiration from your environment, whether that be the mountainous trails of Austria (p60) or the streets outside your own front door (p34). Hitting the books (and tablets, phones and laptops) is also a good way to find running inspiration. So we’ve curated our own Men’s Running library of essential reading and watching (p42), meaning you can gen up on training tips and courageous stories, while also keeping tabs on the amazing feats being performed by the professionals. Speaking of which, with athletic titans such as Mo Farah and Scott Overall entering the twilight of their careers, we look at the next generation of UK runners (p66) who’ll be inspiring people to lace up their trainers and find themselves through running. All this plus our usual mix of races, kit, recipes and training tips. 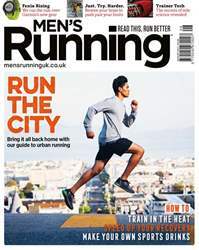 Men’s Running delivers editorial content which is 100% relevant to men who run – beginner or regular runner. Whether it’s ditching your gut, clearing your head or getting in shape for a race Men’s Running is the running magazine which understands the modern running man. Men’s Running has a strong focus on credible testing of the latest running technology and gadgets and honest reviews of the best running gear on the market. Every issue includes Trail Zone – our ‘mag within a mag’ which focuses on the growing off-road running scene with reports, workouts, races and kit suggestions for all of your trail running needs. You'll receive 12 issues during a 1 year Men's Running magazine subscription. Below is a selection of articles in Men's Running Aug-17. You'll receive 12 issues during a 1 year Men's Running magazine print subscription.